In medium bowl, stir or sift dry ingredients together; beat egg, buttermilk, brown sugar and oil together. Stir into dry ingredients just until moistened; batter should be slightly lumpy. 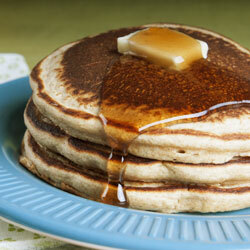 Pour ¼ cup batter for each cake onto a well-seasoned hot griddle. Flip the pancake when bubbles appear on surface; turn only once. Substitute 1 and 1/3 cup 1% milk w/1Tbsp. lemon juice or white vinegar added for buttermilk. Add ½ cup fresh or frozen blueberries. Serve hot, chunky, spiced applesauce or thick fruit sauce over cakes instead of syrup for extra nutrition and fiber. Nutrition: Each pancake provides approximately: 78 calories, 3 g protein, 12 g carbohydrate, 2 g fiber, 2 g fat (0 g saturated), 19 mg cholesterol, 9 mcg folate, 1 mg iron, 178 mg sodium.